Can you guess the meaning of the couch potato idiom just by looking at the picture? 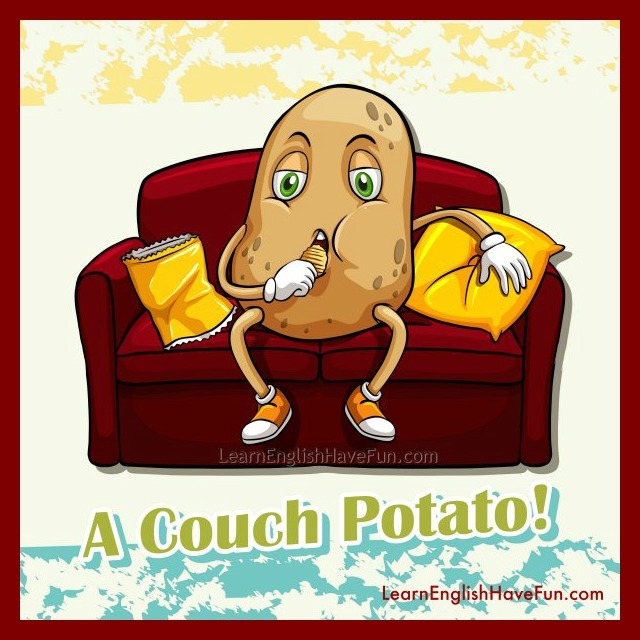 A couch potato is a popular expression in American English so it's worth learning. Couch potato: A very lazy person who sits on a couch watching television all day. Notes: A couch is another word for sofa. A potato is a big, round, solid food. It's heavy, not light, so it's easy to imagine a potato not being able to move very easily. Couch potatoes barely move, unless they are reaching for the remote control to change the tv channel. Couch potatoes also often eat unhealthy foods (e.g., chips or sweets) while watching television. They are often considered unhealthy and overweight as a result of being lazy and not moving around. Please note that we don't use this phrase to talk about people sitting at the computer. It's specifically used for people sitting in a comfortable chair or sofa watching television for long periods of time. Our son has become a real couch potato this summer; all he does is sit in front of the tv watching reruns of old sitcoms and baseball games. The reason she never invites you over to her house is because her mother is a couch potato and she's so embarrassed about it. It doesn't bother me that my dad is a couch potato. What I cannot believe is that he watches all of the "Real Housewives" series and "Keeping up with the Kardashian's!" Get up and do your homework! There will be no couch potatoes in this house! I never thought I'd become a couch potato but I'm so tired after work that once I sit down I can hardly get back up! Final note: Did you notice that the plural of potato is potatoes (not potatos)! I continue to add idioms so check back soon for more or sign-up for my free newsletter to learn about new updates to my website. So here's the moment of truth. Are you a couch potato? Do you know any couch potatoes? I have to admit that I don't like tv so I'm not a couch potato... but I absolutely love to each chips! Try to write a sample sentence using this idiom in the comments below. This will help you practice your English and remember this idiom in the future. Return from couch potato idiom to the main idioms page.